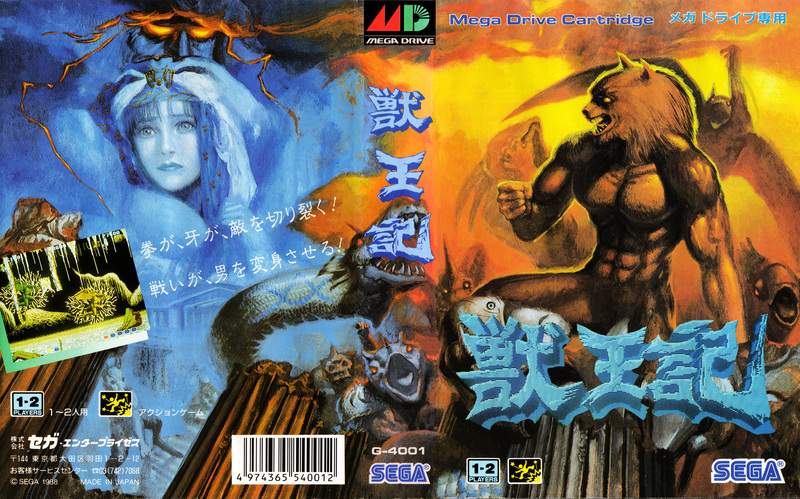 Altered Beast is known as Jyuuouki or “Chronicles of the Beast King” in Japan. 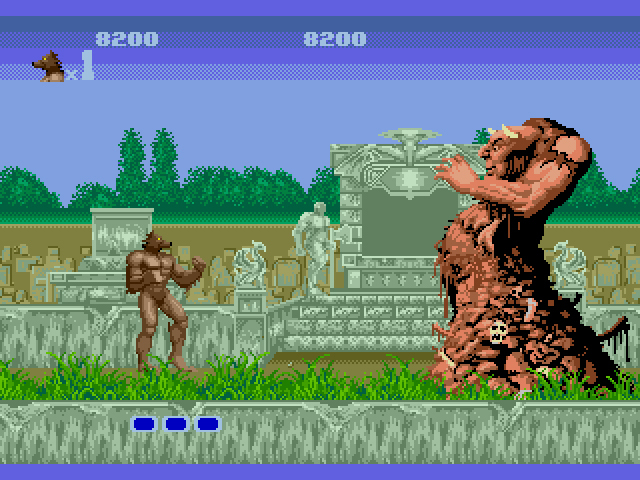 If you happened to purchase a Genesis prior to Sonic’s unveiling in 1991, Altered Beast was your pack-in game. The beat-em-up was slow, short, difficult, and didn’t entirely resemble the arcade version. 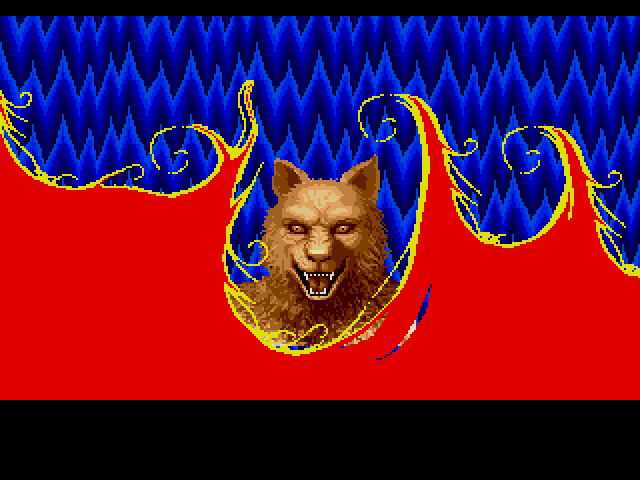 And yet, despite these hindrances, Altered Beast is kind of awesome, in the same way that your favorite hair metal band is awesome. Clunky, old, and outdated, but the rawk remains. Just a couple oversized beefcakes looking for Aphrodite’s temple. You play as a no-name dead centurion, resurrected by Zeus to save his daughter Athena from the Demon God, Neff. For being undead, the centurion has a surprisingly sculpted figure, made more apparent by his lack of clothing. Each level is a Greco-Roman cavalcade of zombies, bulls, and demonic creatures that you fend off with your warrior fists/kicks. The enemies explode into bloody chunks – understandable, since creatures tend to have blood in them, but surprising to see on a home console in ’88/’89. The blue bulls are the ones to focus on: slaughter them and they unleash power-ups that enhance your physique. The first two power-ups beef you beyond Arnold measurements and give you a slight projectile weapon, but the third transforms you into a full-on were-beast. You’re not invulnerable in were-beast mode, but you are hairier (most of the time) and you do have a larger projectile and a special attack that differs depending on the beast. 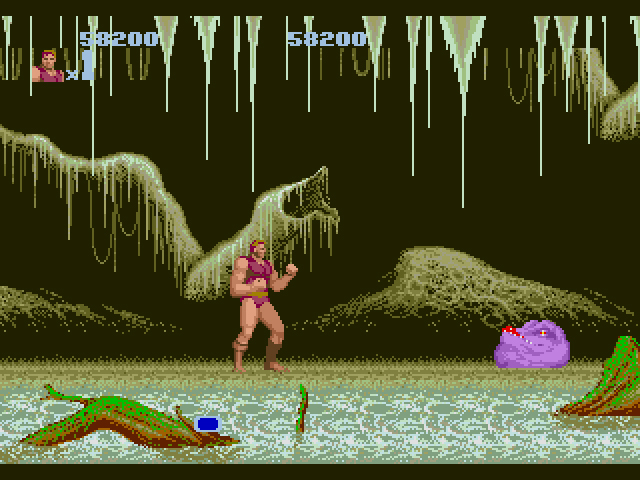 Say what you will about Altered Beast, but this screenshot is forever. There are five beast transformations, one per level. The Werewolf fires energy balls and horizontal kicks across the screen, damaging everything in its path. The Were-dragon flies, shoot lightning from its mouth, and creates a lightning shield around its body. The Were-bear is cute, chubby and has an impressive roll jump, along with the ability to turn creatures to stone. The Were-tiger is similar to the Werewolf, but its widescreen attacks are vertical instead of horizontal. Finally, the Golden Werewolf is… about the same as the Werewolf, only a touch stronger and far more valuable. If I were that boss, I’d want the werewolf to kill me. In beast-form, you’ll take on Neff, a bald Roman senator-type who flashes lightning in your general direction when you first see him. If you haven’t yet transformed when you first see Neff, he’ll putter off and you’ll play through more of the level. This is a potential conundrum. Getting three power-ups quickly will lead to an early boss battle, making the stage even shorter than it already is. Not having the power-ups will prolong the stage, but with the extra content comes the potential to take damage and lose lives. Since there are no extra lives and no continues (without codes), you’ll want to conserve as much health as you can along the way. 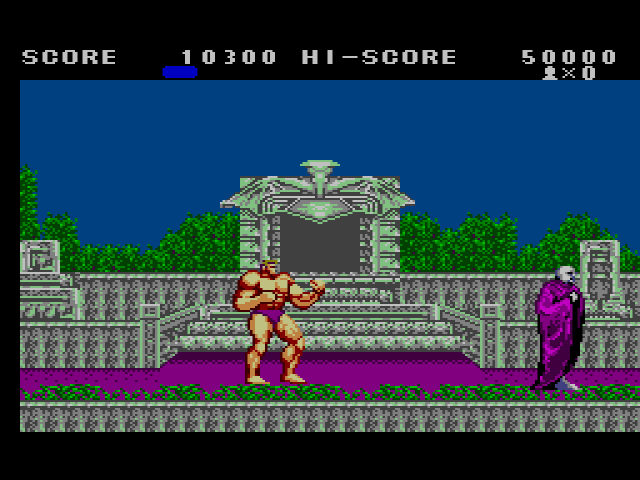 Yes, Altered Beast is about as hard as the centurion’s sinewy abs. Not because the fighting is challenging, per say, but because your Adonis is big, bulky, and slow, even when he’s not powered-up. While most of the enemies move at a fairly slow speed, some, like the bulls and the insects, charge at you. Get caught in the midst of a couple enemies and they will juggle your health down. If you don’t hit the enemy smack in the middle of its face or body, there’s a chance your hit will sink through the enemy’s body and you’ll end up taking damage. If you get hit, there’s no brief window of opportunity where you’re invincible to recover. Straight abuse, all the way. This pre-chewed Bubble Yum will latch onto your head, if you let him. Once you know how to exploit the boss patterns, Neff’s transformations are fairly easy. For example, in stage 2, Neff morphs into a plant that shoots out a dozen eyes at a time. As the Weredragon, spam your lightning shield right in front of his “face” and he’ll disappear in a cloud of smoke within seconds. Not all of Neff’s creations are taken down so quickly, of course, but most of them do have specific weaknesses. The plant might look intimidating, but seriously, eyes against a were-dragon? 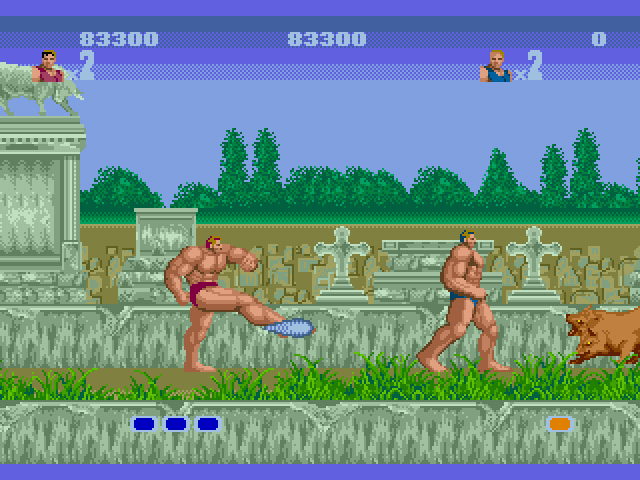 Beat Altered Beast in the arcade and the game is revealed to be one large movie production. All of the “cast” – the monsters, the centurion, Neff – celebrate the end of filming with a round of beers, then the credits roll. The ending sounds cliche’ today and might have been back in ’88, but I can’t think of any other game that pulled this sort of Biggie Smalls “It was all a dream” so early (I’m sure I am wrong – please vigilant readers, let me know!). 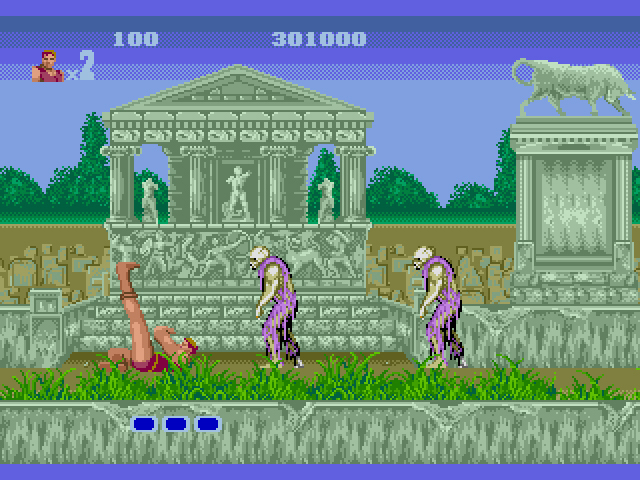 Sadly, the Genesis version deleted this scene in favor of a straightforward credits sequence and the ability to control the centurion in front of a backdrop for Stage 1. Not quite as cool. Just say no to dragon snails, kids. Yeah, the arcade Altered Beast has a better ending, slightly faster gameplay, and a more comfortable feel, but the Genesis version is still metal. “Rise from your grave!,” “Pow-er up!” and “Welcome to your doom!” are some of the most classic examples of voices ever found in a video game. The character design is both ridiculous and timeless. Who could forget Neff standing at the end of a level, smiling and holding his robe while lightning emits around him? Or the freaky troll boss in stage 1 that throws heads at you? Or the brilliant image of the centurion when he first transforms into a werewolf? I’ll be the first to admit, the actual fighting portion of this beat-em-up isn’t that good, but the presentation around the gameplay elevate Altered Beast to more than the sum of its parts. The were-tiger reveals his true cowardly colors. Should we be talking about Altered Beast with such interest today? 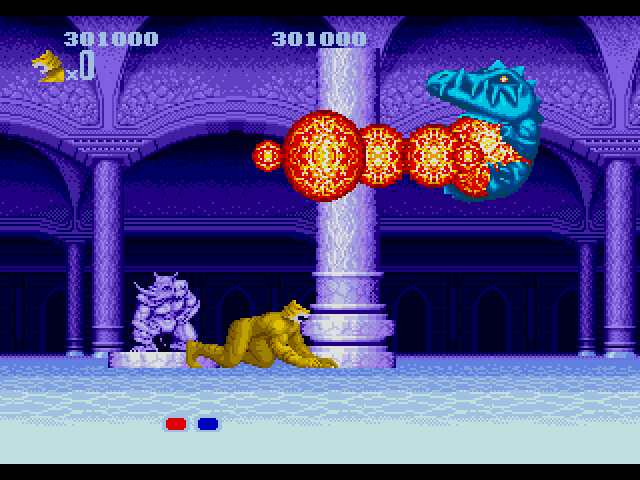 Probably not, but the fact that we are – whether due to millennial nostalgia or an overreaching ironic enjoyment – means Altered Beast has a sort of undying power, perhaps similar to the kind used on the centurion of old. Rise from your grave, reader, and experience the game’s tongue-in-cheek madness anew. “POW-ER UP”? More like HUR-RY UP! Altered Beast on the Master System is distinguished for its remarkable slowdown and sprite flickering. Sure, the visuals are somewhat impressive for a Master System game, but only when there’s little action on screen. The Genesis port couldn’t be called a fast game by any means, but you never questioned its pace while you played. The Master System is obviously buckling under the weight of a game it wasn’t meant to handle. For example: when you reach Neff in the first level, the centurion and Neff stand and stare at each other for what feels like an unreasonable amount of time. If you’re in beast mode, Neff will transform and if not, he’ll walk away, as in the Genesis and arcade versions. But regardless of the centurion’s state, the whole process – from arrival to either transformation or silent walkaway – takes about fifteen seconds. And believe it or not, that’s a long time for nothing to happen in a game, even in 1989. 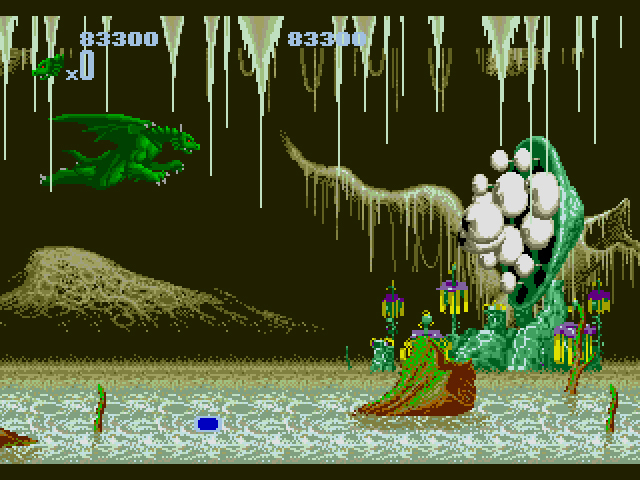 Altered Beast isn’t as unplayable as the laggy, broken mess that is Space Harrier 3-D. 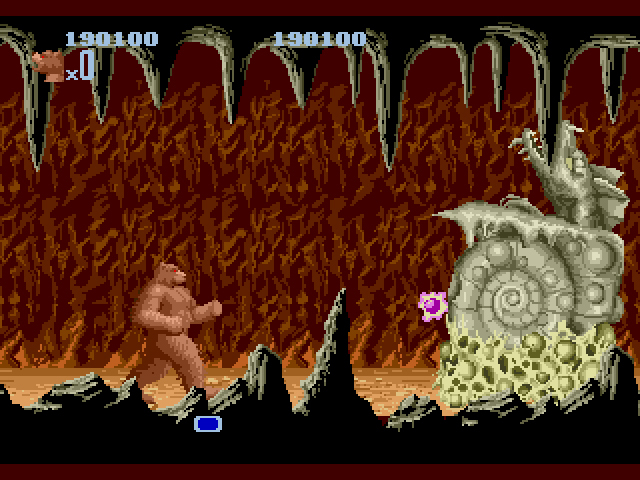 If you had the willpower and patience, you could beast your way through the game’s four levels. But why would you do this, particularly today, when better versions of Altered Beast are as numerous as Abraham’s offspring? +1 for actually calling Biggie by his proper name. Always hated that other name he was forced to use. This port added an extra background layer or two. Really enjoyed this review and your enjoyment of the game shines through. I’m in total agreement there is just something about the setting, stunning presentation (for the time) and those classic booming voices that give the game an evergreen appeal. You might not love it, but you’ll always remember it. 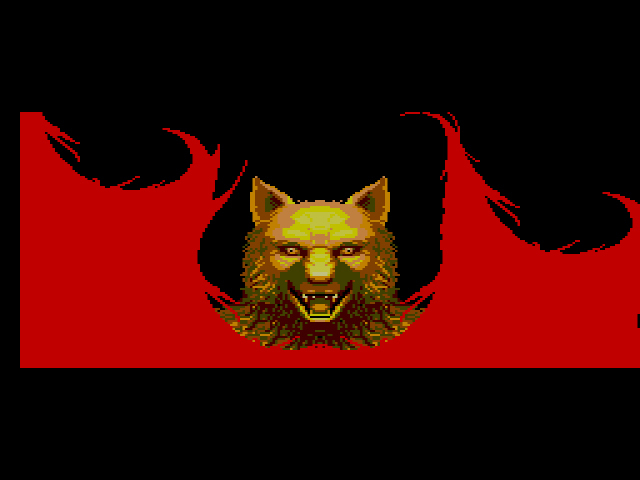 Ahh good ol’ Altered Beast. My Mega-drive came with it, this sure brings back memories. I agree pretty much with this review. It was fun to play and it was a good showpiece for what a 16 bit system could accomplish. I don’t think it was a great choice for a pack in game with its narrow demographic. It didn’t have much replay value in my opinion also as it was as linear as a game can get. I have to disagree on the difficulty however. This game is as easy as they come when you figure out the timing of the enemies. I am not surprised that you would find this game easy, haha. Lol, seriously though this game is easy. Out of all the games you said were too hard, this is by far the easiest. And I would consider myself just an average game player. I would definitely say it’s the easiest game out of all the games I’ve claimed are hard. But I still think it’s challenging. To be honest, I’m as surprised as you that I liked Altered Beast as much I did this playthrough. The game’s kinda bad, but it’s an enjoyable bad, a B-movie bad. Looking at it from any other lense than that, yeah, Altered Beast is a C+, tops. This game being the launch game is something a lot of people are really familiar with. So there are a ton of opinions on it. For me to put it in perspective, when I first played the arcade game, it was the best looking game out there. It was just amazing. I really loved the arcade version. Then when they announced the Genesis and this was the pack in, I was really excited because I really liked the arcade. And you know the graphics on the a Genesis port were really good. For a first game ever for the Genesis in fact it was better than any other console game at that time. It was a good port. But the problem I guess is it is not a very long game, it’s really built for the arcade. And fairly quickly you could beat this and play some 2 player. And then that’s it. It doesn’t really stand the test of time. Now it’s a fairly shallow game, and the graphics are not a wow factor anymore. It just was really a game of its time. Not bad, not great. I think B is fair. There is nothing wrong with it, it’s just so much of the appeal is dated. I don’t have much to say or add, but I always appreciate your perspective, Sean. You were there! You remember! I was four and too ensconced in the original Super Mario Bros. to care about anything else gaming-related. I also want to add I love the picture captions. And maybe post things I don’t like about this game. The human moveset is really limited and basic. Exercise kick included. Was lazy to recycle the werewolf form. The Bear forms powers are never really utilized well. 5 levels is really short. The bosses all go down too easy. The cinematics were changed a bit from the arcade. The ending as noted was changed. The dragon is overpowered. Once you get him level 2 is a cakewalk. Player 2 be stealing ma orbs all the time. Completely agree with the B Movie metaphor, it’s a terrible game but great fun. What about the Master System version of Altered Beast? Aren’t you going to cover it? I will update the article to include the Master System version in 1989. I no longer review all versions of the games at once. I never understood the following this game has. Even back in the day I thought it was a bit overhyped with a mate of mine who constantly raved about it. Its not the worst game I have ever played but for me its just a bit mundane. Tough as you say but just mundane. I watched a Classic Game Room review of the Master System version recently and apparently that was terrible. Yeah, the Master System version is just awful, from what I understand. I haven’t played the Master System version but your description reminds me of those weird Chinese NES bootlegs where you could play a washed out glitchy Sonic on a system it was never made for. That’s exactly what it feels like. Having played (and paid for) Altered Beast on the Master System, I got to agree with kurdt13, it does feel like a bootleg. As a kid, I rejected it quickly and can barely remember playing it. Graphically, it looks fine on still screenshots, but the actual gameplay is awful. Wow, what is this? What nostalgia! I played that hard with my dad on Mega Drive. What a delight to remember. Does Sega think about doing something in this scenario for the future? I do not know if I was a child but I was fascinated by everything in the game. 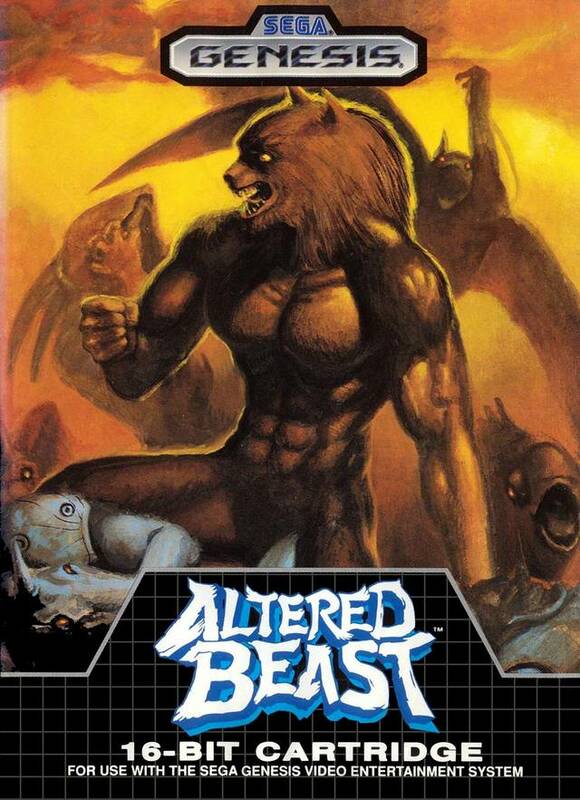 I doubt they’ll ever make another Altered Beast again, sadly. It’s a one-of-a-kind! I picked up the PS2 reboot Project Altered Beast a while back not played it yet. Not heard good things but I’ll keep an open mind. Just discovered your excellent site today, really nice reviews and I even got the rock, paper, scissor reference up top! For me it has always been about the trimmings in this game, especially the before level creepy gothic purple torture scenes. A true metal masterpiece that will never die! Kudos! Thanks for the kind words, Alistair! I’m glad someone appreciates Altered Beast as much as I do!